Formed, in 1993, as a result of increased awareness and interest in the Cathedral during the 150th Anniversary Appeal, the Association exists to support the Archbishop, Dean and Chapter by providing funds for special projects and activities within the Cathedral. Members receive the Basilican Magazine twice a year, an invitation to the Civic Mass, Annual Association dinner and other events. This gives members an opportunity to become involved in the life of the Cathedral. With your help we could do so much more to preserve and enhance this unique church. 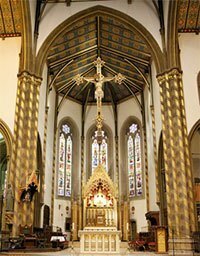 ST CHAD’S CATHEDRAL was designed by Augustus Welby Pugin (1812-1852) and completed in 1841. St Chad’s Cathedral has a unique place in the history of England. Pope Pius XII made St Chad’s a Minor Basilica in 1941. Major changes were made to the interior in the late 1960s to adapt the sanctuary to the requirements of the reformed liturgy. The early 1990s brought a restoration which highlighted the outstanding characteristics of Pugin’s design and which included hanging in the chancel arch the crucifix which had been removed in the 1960s and laying a tiled floor with underfloor heating. A new organ was built in 1993 which has won recognition as a fine mechanical instrument. It is located at the West end in a gallery so that choir and organ are together again, where Pugin had originally decreed that they should be. The Cathedral’s fine acoustics make it an ideal venue for concerts and the liturgy is enhanced throughout the year by the Cathedral singers. Seat of the Archbishop of Birmingham, St Chad’s Cathedral is the Mother Church of the Diocese which covers the West Midlands, Warwickshire, Worcestershire, Staffordshire and Oxfordshire. It makes an important contribution to the spiritual and cultural life of the City and the Diocese. Although it has only a small residential parish, the Cathedral is a place of worship for many city centre workers during the week and visitors from near and far at weekends, in addition to those who make it their regular church. The Cathedral is an internationally significant building being the first R C Cathedral to be built in the UK since the Reformation. Bishop’s House was one of Pugin’s important domestic buildings. It was situated opposite the Cathedral in Bath Street, was knocked down in 1960 to make way for the new ring road development. Some of the contents were sold and, quite recently, one of the corona ceiling lights was up for auction at Bonhams, with the asking price of £10 – 15,000. Apart from the Cathedral being of Pugin design, internally the building is awash with Pugin delights. The altar and reredos of the Lady Chapel were designed by A W Pugin as was the tabernacle. The windows were designed by A W Pugin and made by Warringtons. The oak statue of Our Lady is a 15th century German work and was a personal gift from Pugin. It is claimed to be the first statue of Our Lady erected for public veneration since the Reformation. The gilded casket above the Shrine Altar was designed by Pugin from the Venerable Bede’s description of the original Lichfield Shrine. Windows in the apse were designed by Pugin, made by Warringtons, and paid for by the Earl of Shrewsbury. The oak Archbishop’s throne or ‘Cathedra’ was designed by Pugin circa 1850 and first used for the enthronement of Bishop Ullathorne. Pugin provided the Cathedral with some fine Medieval furnishings which he had acquired on his Continental ‘jaunts’. The 15th Century German Canons’ stalls came from a church in Cologne. They have misericords under the seats with fascinating carvings. The Rood Screen, embellished with Medieval carvings, was yet another Pugin item and was a subject of much controversy. Bishop Walsh gave way to Pugin and it was installed but removed in 1967 when the Cathedral was reordered. All that remains is the huge Crucifix which is suspended over the Sanctuary steps. Beneath the Cathedral is a spacious Romanesque style crypt, containing several chantry chapels which can be reached by a staircase next to the font. The cloth-of-gold vestments worn by Bishop Walsh at the consecration were designed by Pugin as were the cope and plate and these are held at the Cathedral. 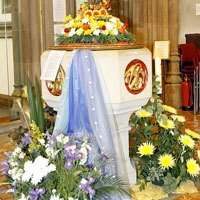 Fund raising events include our annual Flower Festival in June. This year it closes with a concert by The Birmingham Schools Wind Orchestra; a generous Raffle and tours behind the scenes of the Cathedral with supper afterwards for Parishes, other Societies or Associations who may be interested in the history of the Cathedral. We also provide catering and assistance at major events in the Cathedral in conjunction with Cathedral staff. The Committee is elected at the Annual General Meeting in October. The 11 members are all Trustees of the Association. Our President is the Most Rev. Bernard Longley Archbishop of Birmingham. People throughout the diocese (and beyond) are invited to join the Association and share this special link with our Mother Church. The Association keeps members in touch with events during the year through the Cathedral diary and a twice-yearly magazine –The Basilican – which is always on sale in the Cathedral. or hand it in at Cathedral House. These are the two photographs, from the many taken at last years Flower Festival, that we have decided to use as notelets to try and raise even more funds to support our Cathedral. They are now available from Reception during the week and after Mass on Sundays at the back of the Cathedral. They are smartly packed in tens (five of each type) to make them as appealing as possible, at the modest price of £5 per pack. They are of course available to members of the Cathedral Association by application but unfortunately this will attract postage costs. We do hope as many of you as possible will feel that this is an endeavour worth supporting. Why not buy some as an Easter gift for friends and family? Come and join us for the 2019 Flower Festival and help us make this an even more spectacular event than ever. We hope you will put the date in your diary straight away. We are keen to encourage people of all faiths to join us to make this a truly ecumenical event. The set up day will be Thursday 13 June from 9.00 am until late. The judging will take place on Friday morning. Prizes will be presented on Sunday evening during our concert interval. 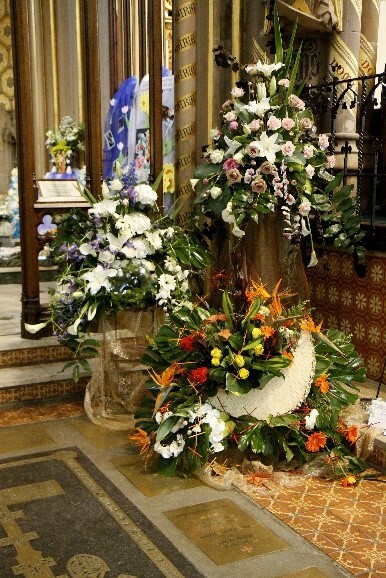 The theme will be ‘In the footsteps of Our Lord’ for all three categories: parishes, convents and flower clubs, primary schools and secondary schools. This is a very wide theme and may be approached in whatever way you wish. The disciples followed Our Lord’s footsteps. St Paul and many other saints followed the path Our Lord had led. Think of the lovely Poem ‘Footprints’. Early in January we sent out a letter asking people to let us know if they are interested in taking part. We have arranged a coffee morning on April 10 at 9.30 am, in Cathedral House, for all those who have expressed an interest in joining us to explain in detail the arrangements and give them an opportunity to pick their location in the Cathedral so that they can develop their ideas in more detail. Do please come and join us to make the 2019 Flower Festival the best ever. You will be made very welcome and make many new friends. 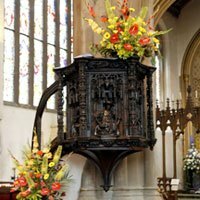 If you know any flower arrangers who might like to join us please ask them to contact me.